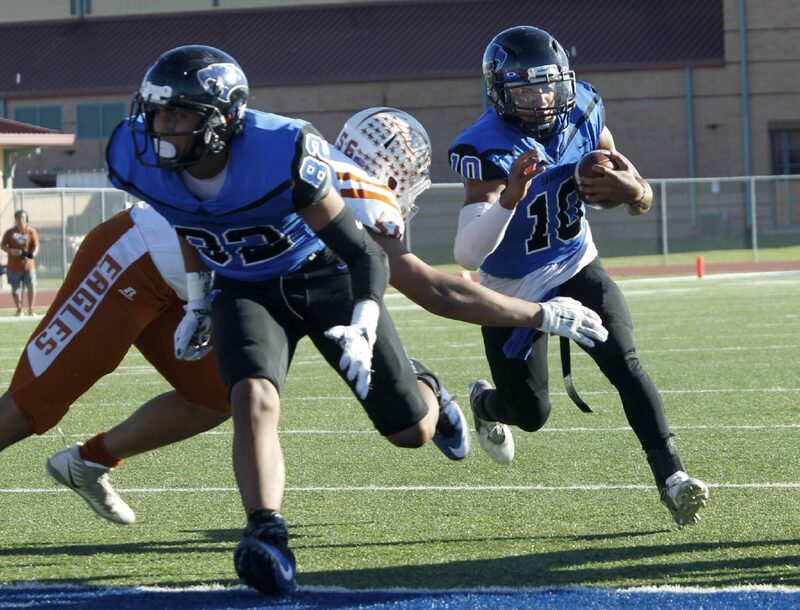 Edinburg Vela quarterback Nate Garcia runs past Eagle Pass' Sebastian Hernandez for a touchdown during the third quarter of their Class 6A area playoff game Friday, November 24, 2017, at Laredo Student Activity Complex in Laredo. EDINBURG — On the night of Nov. 2, the stands on both sides of the field at PSJA Stadium were full, and the whole Valley was watching to see which side would prevail in a battle of undefeated teams. 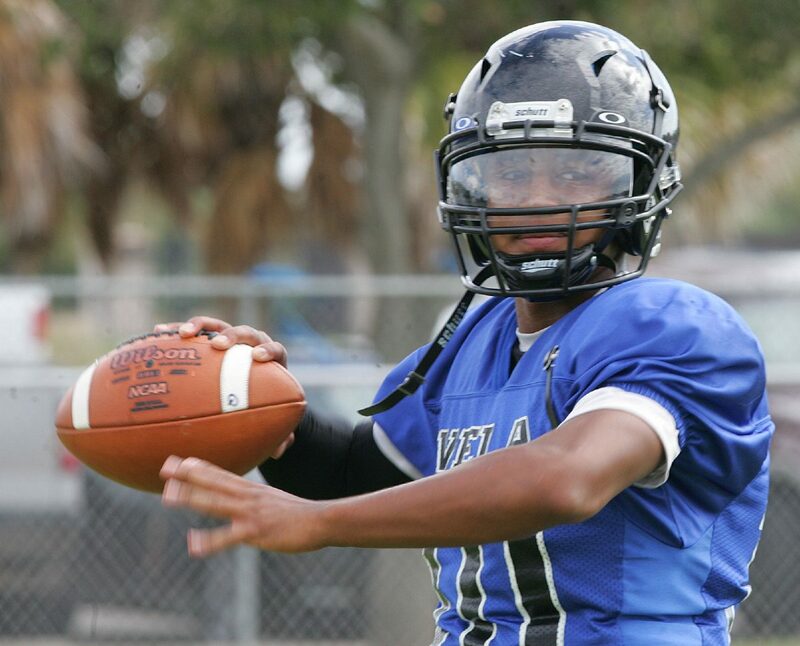 Edinburg Vela senior quarterback Nathan Garcia rose to the occasion and led his team to a 70-22 victory over PSJA High that served as a dictum on who was the best in the Valley. Garcia never got to wear the title of best quarterback in the Valley. Players like Mission Veterans’ Landry Gilpin, PSJA High’s Trey Guajardo and Weslaco East’s Richard LeFevre were the talk of the town. But Garcia has never needed a spotlight. Garcia is the type of player who does everything right, whether he is alone or the whole city is watching. 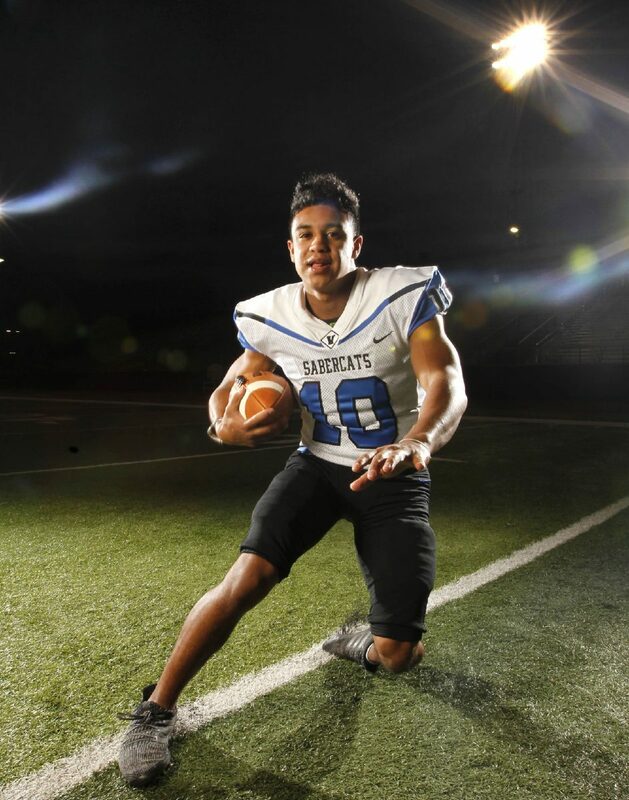 All-Area Football Offensive Player of the Year safety Nathan Garcia of Edinburg Vela. That workmanlike attitude led Garcia to many successes this year. He finished the season 155-of-223 passing for 2,215 yards and 23 touchdowns. He only threw five interceptions on the year. He rushed for 146 yards and four more scores. For his performance this year, Nathan Garcia is The Monitor’s 2017 All-Area Offensive Player of the Year. Daniel Enriquez, a junior, and his brother, senior Nick Enriquez, grew up playing with and against Garcia. He can throw the ball a lot deeper now. In the first three plays against PSJA, Garcia had two touchdown passes of more than 20 yards. That game changed a lot of people’s minds about the best quarterback in the Valley, but Daniel Enriquez didn’t need any convincing. One game can’t summarize a career, and in Garcia’s case, any one game doesn’t tell the whole story. Garcia’s value really shines in his consistency. Garcia had seven games this year with more than 200 yards passing. He had three others around the 180-yard mark. His completion percentage was only below 60 three times this year. Garcia finished his career with a 68.0 completion percentage, 4,571 passing yards, 47 passing TDs, and only eight interceptions. While the game against PSJA was his favorite to be a part of, Garcia had one moment in mind to recap his season.